The longtime favorite of Cannon Beach, the Haystack Rock Awareness Program is a north Oregon coast institution. HRAP for short, it’s known for a variety of things, but its most public face is its volunteers on the beach at famed Haystack Rock, helping visitors find all the cool stuff and engaging nooks and crannies. Haystack Rock Awareness Program also helps administer its unique wheelchairs on the beach program, where two wheelchairs are available to borrow for those with access issues to the sands. Haystack Rock Awareness Program’s larger purpose is a program of stewardship and environmental education where the primary mission is protect the area. These marine gardens are packed full of a closely-entwined bird ecology and a intertidal habitat which require a kind of constant monitoring and vigilance. Its schedule on the beach can vary greatly: it’s highly dependent on weather and always coincides with low tides. The program brings volunteers to Haystack Rock and the Needles to help you find and see the myriad of tidepool wonders and vibrantly colored creatures therein. Interpreters and staff are well trained to assist you in that regard. They also post interpretive signs when special natural occurrences take place, hand out educational brochures, and sometimes provide bird stations with spotting scopes and maybe even display tanks and microscopes. Among the highlights of the year is the season of the tufted puffin, where the colorful bird colony returns from April through August to breed and raise their young. Staff help you spot these as well, often with high-powered optics to really zoom in close. They are out there daily, at low tide, but this also depends on the season. You can see the low tide schedule here (note that Cannon Beach uses the same tide tables as Seaside). The protection aspect of the HRAP focuses on keeping the intertidal zone of Haystack Rock safe from harm, even if untended. They do this by posting various signs and keeping the public informed through their questions. Another aspect of the beach that comes up which HRAP addresses is when someone finds and injured animal or bird. Officials everywhere on the Oregon coast urge to not touch any such animal or bird. The most poignant example is baby seals, which are only resting on the beaches and not stranded or in need of human help. You can actually harm the little creature's existence as their mothers may get spooked by the human scent attached to a seal if it is touched. Many animals lying on the beaches, whether or not in obvious signs of distress, need to be left alone. You can also catch a nasty disease from handling such an animal. Call local authorities if you spot some critter stranded on the beach. The Haystack Awareness Program started in 1985, and has since then educated and inspired thousands upon thousands of visitors to the north Oregon coast to learn and even continue learning about the natural resources of this special place in Cannon Beach. The program has also assisted many in the past to appreciate the natural side of their own areas at home. 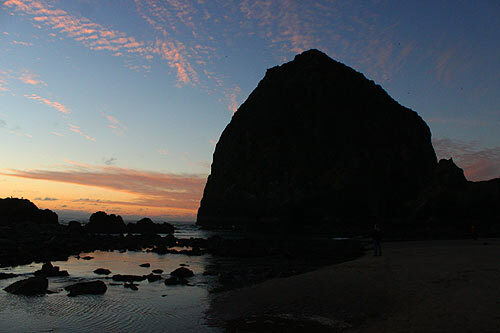 See updated news about the Haystack Awareness Program here, as well as posts and updates from the Friends of Haystack Rock. More about Cannon Beach below and at the Cannon Beach, Oregon Virtual Tour, Map. Lodging in Cannon Beach - Where to eat - Cannon Beach, Oregon Virtual Tour, Map. Stewardship Report: The Pigeon Guillemots are Back!